erica at ps i made this always has the best diy ideas, so when i see an email from her in my inbox i know something good is coming. today she’s been kind enough to share a fun, simple diy idea that transforms inexpensive plastic toys and objects into chic objet d’art. inspired by harry allen’s famous gold pig, erika decided to us metallic spray paint to create chic home accessories. all it takes it a small collection of plastic knick knacks (check your closets, local thrift shop, flea markets or toy stores for good examples), a few minutes and spraying and voila! shiny new pieces for your living room. thanks to erica for sharing this project with us! Toys- Animals and objects with texture have the best results. -Make sure toys are clean, use a damp paper towel to wipe of any dust for a smooth finish. PS- Style spray metallic objects on floating shelves, on top of coffee table books, and on your coffee tables- also makes for a great gift! *Click here to follow Erica and her fun DIY ideas on Twitter! Hmmm… let me count how many things in my apartment I can spray gold and silver! So many choices! :) Not sure I can get the spray paint in the city of Chicago, but I will try! i love the croc! will have to do something similar! Looooove it! metallic? gold? easy? I am so there! Thanks for this ladies! It is awesome. When I was a kid, my brother and I used to do this ALL the time. We even froze bugs then turned them to gold. Great idea! I was threatning my sister that I will throw out her collection of a mini cooper, a vespa,…. Now I know what to do with them. I see you used Krylon brand of spray paint. Have you tried their mirror spray paint, which will turn ordinary glass into a mirror? Thanks! I love this idea! I need to go find a big plastic alligator now! I have this old plastic hobby (spring?) horse I obtained walking past a house with my dog on a heavy trash day. Some pieces of the dowel are trapped inside, which I may never get out, but free is free. I have been trying to decide what color I want to paint it, do you think this is too large for metallic spray paint? Do I need to prime it first? primer never hurts, especially on plastic. Hmmmm I think I saw a pretty cool horse in my nephews backpack last Sunday at church. I’ll go get it! I adore this idea. Thanks for the post! Very cool idea. That alligator is absolutely the best. I LOVE this!! The crocodile is the best!! Great idea! I’ve already got a few cans of spray paint in antique gold, white, black, etc.! We used the gold on three hanging light kits to match the pendants and they turned out beautifully. I’m inspired to go through my ‘outbox’ of potential yard sale-bound items and see what would benefit from being metallicized… Thanks! aww, this is such a good-looking and stylish alligator! love the idea! Amazing! I’ve been on the lookout for brass animals lately but I may need to set my sights on the dollar store instead. Such a great idea. I did the same thing with a plastic horse that now lives on my bookshelf! I also made fun Christmas ornaments last year by painting small plastic animals – the ones you can buy in tubes – and tying them off with colored ribbon a la Kate’s Walnut Charms: http://www.designspongeonline.com/2009/10/diy-project-kates-walnut-charms.html. This technique definitely gets people to do a double-take. I’m decorating a new apartment, and my next stop is garage sale-ing for toys that I can silver-fy. Amazing idea! YaY!!! I’m LOVING this idea! Thanks Grace and Erica. quick practical question: when spraypainting like this, how far will the paint travel? meaning, how large does the tarp have to be? i live in an apartment so can’t do it inside, but there is a courtyard. i don’t want to end up spraying the ground and walls, though . . .
i have the same problem- just get yourself a large cardboard box and put it over a tarp. put your objects in the box and spray into the box- it helps limit the spray-back. I made myself a ‘spray booth’ from a large cardboard box. I cut a large square hole on one side, leaving the top edge still connected to the box so that it makes a flap hinged at the top. I put a bungee cord and a button to fasten the flap in the UP position when I spray. I can spray pretty much anywhere with no overspray, and I can close the flap to move the bpx with the item inside. I have to open it to have the paint dry properly, though. Great idea on the toys spraypainted, I love it! Will check out Dollar Stores also.The alligator/croc is really cool. I actually had this exact idea a few months ago and I rustoliumed a plastic lobster toy silver- it looked awesome. BUT THE PAINT NEVER DRIED. That lobster is still wet to this day. Watch out for that. I think it has something to do with the plastic coating….. Yes i did this, but never dried . What can i do?!?!! i LOVE this. I paint almost everything i get my hands on but never really thought about painting ornaments and objects… I hope the wooden owl I saw at the op shop yesterday is still there as he would look great painted minty green! I just did this today on a really old frame, that was missing pieces, and it came out great! I can’t wait to try some other items around the house! I did this a couple months ago to a white plaster lamp and a buddha head I had (the head was painted to look like stone, it wasnt that cute, but the shape of the head was great), anyway…I sprayed them both with this 24 karat gold spray paint, and it still wasnt realistic enough, so then I GOLD LEAFED THEM! omg it made a huge difference. I now want to gold leaf my entire house. Because both the objects I gold leafed had alot of carving on them, I rubbed in a dark stain to highlight all the carved flowers in the lamp, and the features of the buddha. They looked so antiqued, it looks like I stole the buddha from some 600 year old tibet temple. If your going to gold leaf, I suggest always spray painting a base coat of gold, just incase you miss a few spots. What a fool I’ve been! I was actually buying REAL silver to match the silver “collection” I have in one of my cabinets. Ho ho! Now I’m just going to go out and buy a bunch of cheap, plastic trash and spray paint it silver. Thanks for the tip – you saved me lots. grace, thanks for the tip. now that you’ve said it, i can’t believe it never occurred to me! Chicago Spray paint: I know they have it at the Home Depot in Berwyn (just south of Oak Park). Thanks for the ideas.. love ’em. Great idea! It also works with other materials (I tend to go with vintage ceramics) and colors. 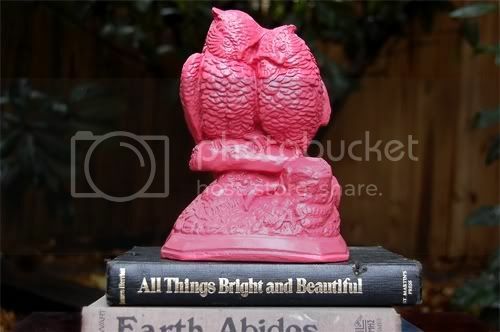 Here’s a beautiful owl statuette a painted pink a couple years back. Ok, I *literally* want to run out to the .99 cents store RIGHT NOW and try this. Totally effin brillz. Sidenote: I keep wondering when I will stop loving the crap out of gold, and it just hasn’t happened yet. I’ve been obsessed for the last 5 years, and its not going away. Anyway…yeah, this rules my face! Thanks! I LOVE the alligator. Does anyone know where that particular one was purchased? I did this with a plastic Superman he is now part of a sculpture I created titled Night Queen. I made my bed so I could rest the horse against the wall, but as soon as I did Maya, my dog laid horizontally where the pillows and blanket meet and started wiggling around until everything was disheveled. And my camera is not so nice. Here is a close up of the after. My camera is somewhat sucky or I just don’t know how to use it properly. I used the Rustoleum Universal Advanced. Now I just need another can and some dowels so I can hang somehow. Have just painted up some op-shop finds for my new kitchen in silver to match the handles! Seems like the Kmart one is out. J. Crew has a similar children’s toy that I did it with and it worked beautifully. I love this so much, I seriously thought about spraypainting my kleenex boxes sitting around my house gold. I did this to a really cool octopus but the paint never dried! Help? Is there something I can do to seal it or help the paint dry? Hello! My spray paint is still so sticky and it’s been drying for weeks. Any tips?? Can I paint or spray a clear coating of something else? This is an awesome idea. Talk about a great upcycle of something that mom’s are bagging to send to the thrift store all the time.